Restate the benefits of customizable rollups. Explain the relationship between customizable rollups and soft credits. Remember that opportunity rollups are fields that calculate values from related records. In other words, rollup summary fields allow information from one record to automatically “roll up” and appear on a related record. 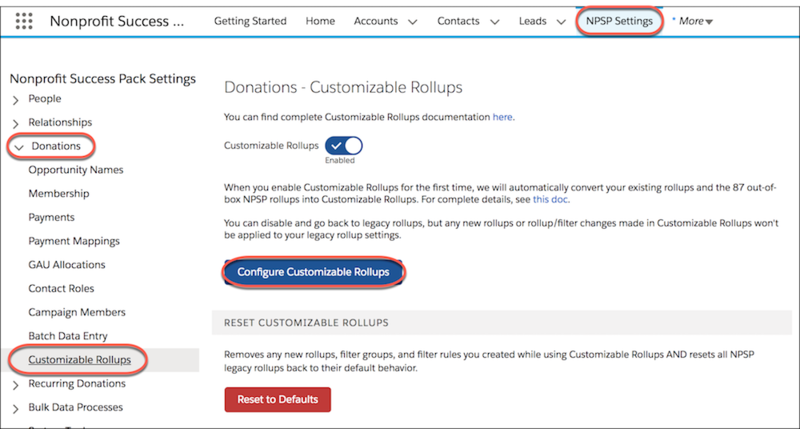 The rollup summary fields on the contact and account records in NPSP are critical to providing your users with a quick overview of the level of engagement that a donor has with your organization. 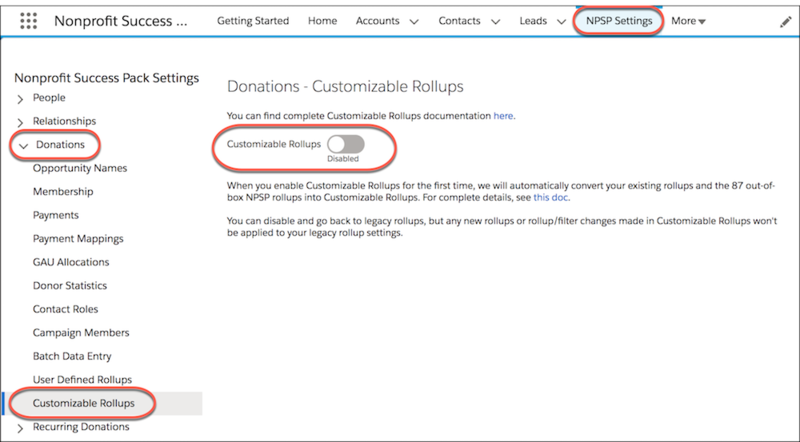 If your organization is satisfied with the more than 80 rollup summary fields that come out of the box with NPSP, you don’t need to enable customizable rollups and you can be on your way. 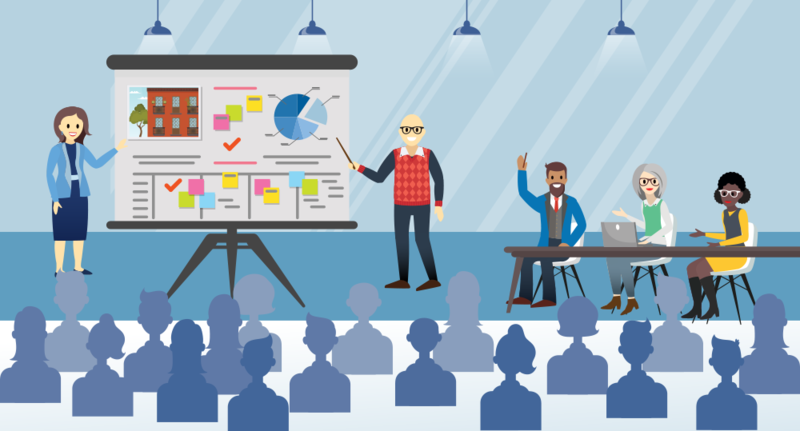 But since every nonprofit is unique, it’s important that you're able to roll up exactly the data you need to the right records. With customizable rollups you can create your own custom rollups, where you define the rollup field and the filters to use. Customizable rollups are available as part of NPSP with the household account model. Depending on when you started your NPSP trial, you may need to enable this feature. 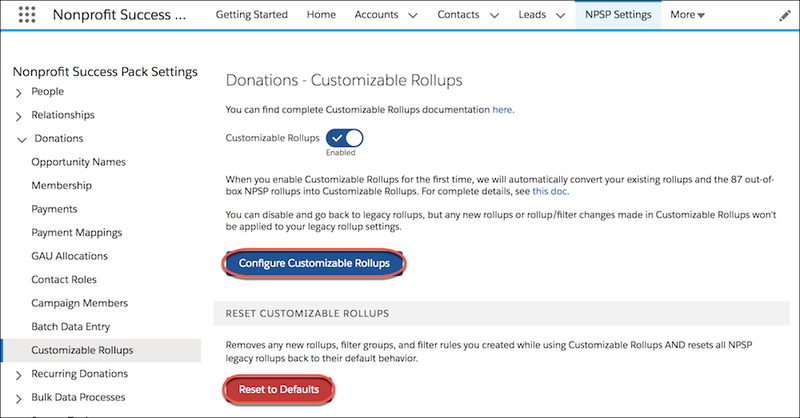 And when you do, it will convert all of the out of box NPSP rollups into customizable rollups. You'll be able to edit the converted rollups or create brand new ones. 1. Click the NPSP Settings tab. If you don't see the tab in your Salesforce org, you can find it from the app launcher. 2. Click Donations > Customizable Rollups. 3. Click the Customizable Rollups button to enable. You'll see two new buttons, one to configure customizable rollups and one to reset to defaults. Before you jump into configuring your customizable rollups, be sure you’re clear about the differences between the two types of rollups. Aggregate rollups: Summarize and roll up data from multiple records into a target field. Aggregate rollups are used for summing, averaging, or counting. For example, NPSP comes with aggregate rollups for total gifts (summing), average gift amount (averaging), and total number of gifts (counting). Single result operation rollups: Copy data from a field on a single record to the target field. These rollups are used for searching through a group of records to find the first or last date, or finding the smallest or largest number (currency, number, etc) and copying data from that record. Out of the box in NPSP, you get single result operations such as largest gift amount, first gift date, and last gift date. With customizable rollups, you can select any field from the single opportunity (or payment) result (including text and lookup fields) and copy it to the target object. Gorav, our admin from the No More Homelessness (NMH) org has enabled customizable rollups in order to meet a recent request from his development ream. NMH is starting a capital campaign to purchase a new building to use for transitional housing for some of their clients. They have assembled a capital campaign committee of board members, community leaders, and corporate funders and they want to be able to easily see the total amount of capital campaign contributions that have been influenced by members of the Committee. 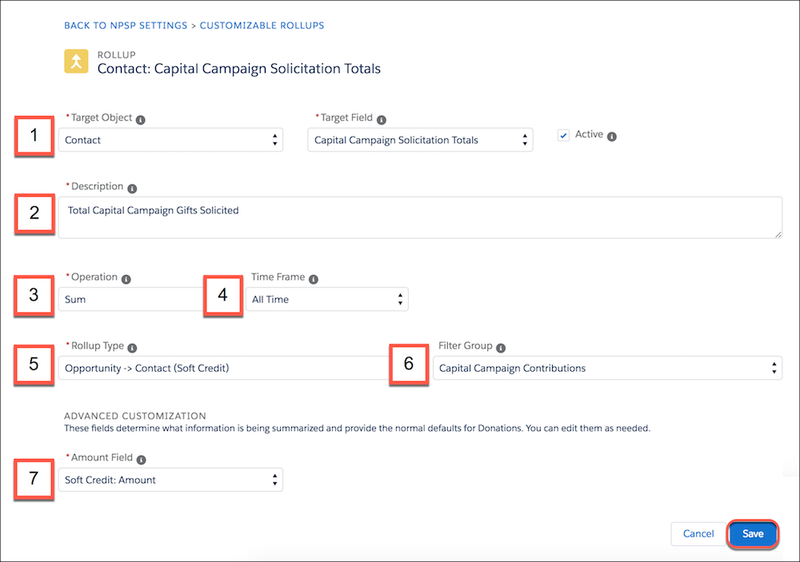 Before he can create his new customizable rollup, Gorav must create a custom field on the contact object to house the rollup data called “capital campaign solicitation totals” as well as a campaign record where NMH can track the gifts for the capital campaign. The “capital campaign solicitation totals” field Gorav creates is a unique, writeable, custom field. As he sets up his target field, he makes the field “read-only” for all other users to prevent confusion. Rollups function properly even if the user who is creating the rollup or viewing the record with the rollup field doesn't have edit or view access to the field. Now Gorav needs to create a filter to include only capital campaign gifts. Customizable rollups come with a set of default filter groups. These filter groups work like reports. 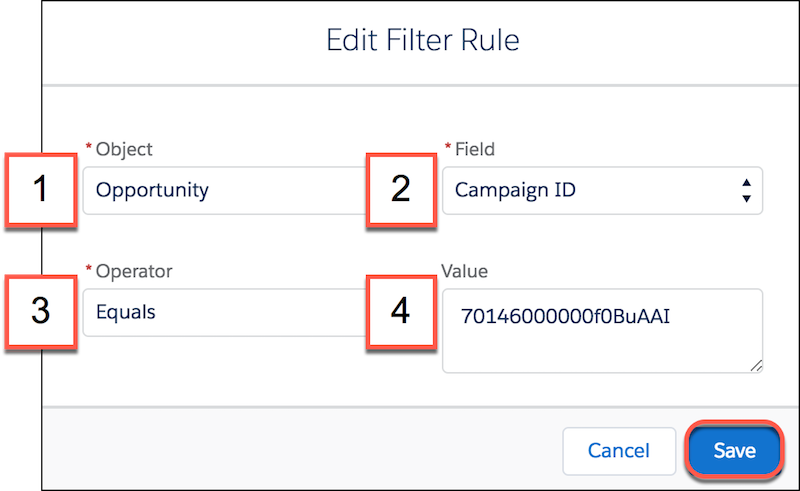 You set up criteria (filter rules) within the filter group that determines what data to include in your rollup. Filter groups make sure you only roll up the data you really need! You can create new filter groups or modify the defaults if you need to. You can also delete unused filter groups, but keep in mind that you won't be able to delete any filter group that has been applied to a rollup. The filter rules determines what data to include in a rollup, so you only get what you need. You can include as many filter rules as you want, but keep in mind that filter rules only use ‘AND’ criteria (there is no ‘OR’). So, if there is more than one rule within a filter group, data will only be included if it matches criteria for all of the rules. Filter rules only apply if the object used in the filter rule is the same as the object in the rollup type field. If the filter rule is for an object that’s not listed for a particular rollup type, that rule simply won't apply, but the rest of the rules in the group will. This lets you do fancy things, like use a filter group with a soft credit filter on a hard credit rollup. 1. Click the NPSP Settings tab. 3. Click Configure Customizable Rollups. 4. Click View Filter Groups. 5. Click New Filter Group. If you want to edit an existing filter group, click the filter group name and click Edit. 7. Enter a detailed description for this filter group. Gorav writes out exactly how the filter rules work within this group. (1) Select the Object. The available values are Account Soft Credit, Contact Soft Credit, GAU Allocation, Opportunity, and Payment. Gorav selects the Opportunity object. (2) Select the specific Field on that object. Gorav selects the Campaign ID field in order to filter to a specific campaign. (3) Select the Operator. The available options are determined by the type of the selected Field. You'll only see operators that are valid for the field type. Gorav chooses the Equals operator to limit to one campaign. (4) Enter the Value. What you can enter in this field is determined by the Operator you choose. Finally, Gorav enters the Campaign ID for the NMH Capital Campaign in the Value field. 9. Click Add to add another filter rule. 10. Click Save. Gorav can now select the filter group he needs to create his customizable rollup. 4. On the Customizable Rollups page, click New Rollup. To edit an existing rollup, click the drop-down arrow from a row, and click Edit. (1) Choose the Target Object and Target Field that the data should roll up to. The Target Object can be Account, Contact, General Allocation Unit, or Recurring Donation. The Target Field is limited to custom, writable fields on the Target Object that aren't currently used by another Rollup. 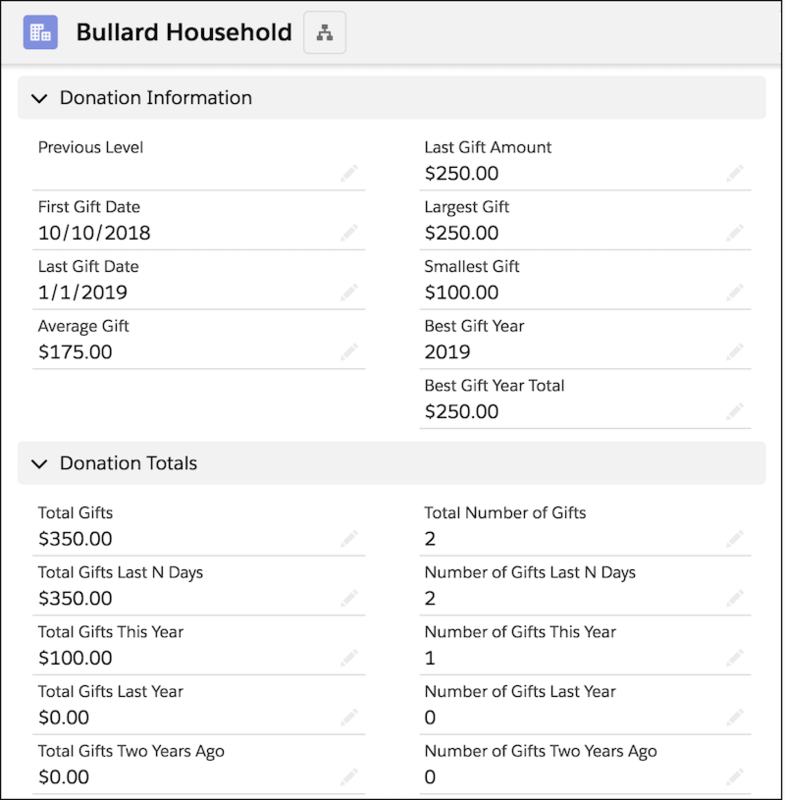 When creating a recurring donation rollup, only use your own custom fields as the Target Field. Selecting an NPSP field as the Target Field will break your recurring donations. 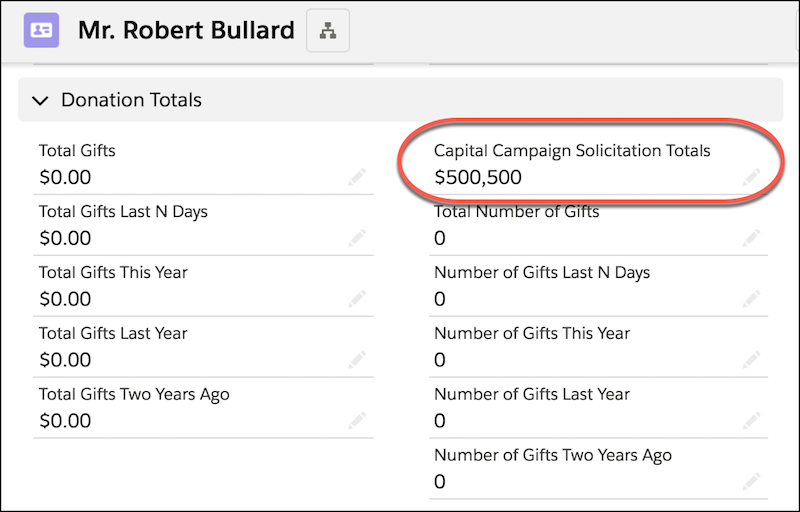 Gorav wants these roll up summary fields to appear on the Contact record, so he chooses that object and then selects the custom field he created called "Capital Campaign Solicitation Totals." (2) Enter a detailed Description of this rollup. This is super important because the Description is what you (and others) will use to distinguish this rollup from all of your other rollups. Gorav adds a brief description for his users. (3) Enter the Operation. Your choices are limited based on the type of the Target Field you selected. The type of Operation you choose determines whether your rollup will be an aggregate rollup or a single result operation rollup. If you want to create an aggregate rollup, choose Sum, Average, or Count. If you want to create a single result operation rollup, choose First, Last, Largest, Smallest, Best Year, Best Year Total, Years Donated or Donor Streak. In this case, Gorav's team wants to see the total sum of all Capital Campaign solicitations. To roll up data for a certain number of days back, choose Days Back. You will then see a Days Back field where you can enter the number of days back (from today) that you want to roll up data for. It's important to note that entering a value of 0 rolls up data for today, while entering a value of 1 rolls up data for today and yesterday. The maximum number of days back you can enter is 10000. To roll up data for a specific year, choose Years Ago. You’ll see a Years Ago field where you can choose the number of years ago that you want to roll up data for. Keep in mind that only the data for that calendar (or fiscal) year rolls up. If the current year is 2018 and you choose 2 years ago, the rollup includes data for 2016. Select the Fiscal Year checkbox to calculate rollups based on fiscal year settings (instead of calendar year). 20 is the maximum amount of years ago you can select. (5) Choose the Rollup Type. The Rollup Type is a combination of the object to roll up along with whether it will be a Soft Credit or Hard Credit Rollup. In this example, Gorav chooses Opportunity > Contact (Soft Credit) so that his team can see the total gifts that were solicited by the Contact. (6) Choose the Filter Group. The filter group is a collection of filter rules that determine what records get rolled up. If you want to include all Records, use the default No Filter Group (Include All Records). You'll see all available filter groups that exist in your org, but be sure to select one that uses the same object that you selected in the Rollup Type field. (7) In the Advanced Customizations section, enter the required information. The fields that appear are determined by the Operation you selected. Voilà! Now the NMH team can quickly see how each capital campaign committee member is doing with their fundraising. In this example, Gorav created an aggregate rollup. If you’re interested in learning more about how to create a single result operation rollup, check out the resources below. Finally, there is a great resource for nonprofits who use customizable rollups called the customizable rollups recipes cookbook! It's a collection of recipes collected from the nonprofit community. Again, find it in the list of resources included as part of this unit.